If you’re looking to upgrade your interior design, adding an interior glass wall will provide you with the ability to design a space that is both individual and trendy. For example, you could add elegant sliding doors to your lounge area, allowing you to transform the living space between dining and lounge rooms. Open the doors wide to enjoy a space for family celebrations, or close them to create an intimate corner for a small dinner party or where you might enjoy a nightcap. If you don’t want such a permanent fixture, a new spring trend is to add a glass divider instead. At CustomCote we offer the latest in interior sliding doors and partitions. Our versatile door system delivers design flexibility, ultra­quiet, smooth rolling action and a modern look unavailable with any other system in the market. Add a glass partition to your family room, creating a quiet space for you to read a book while still keeping one eye on the kids. Thinking your wardrobe could do with a bit of a face lift? Try adding glass wardrobe doors for a touch of sophistication. At CustomCote, our glass doors can be used as wardrobe doors,providing a unique look, while adding to the aesthetics of your home and providing additional light to your bedroom. Not only can our glass doors be used in the bedroom, but you can use them as room entry doors, cavity sliders, pantry doors, room dividers and media room doors (or anywhere else you may need them). Simply mix and match panel inserts to create a unique looking door that will compliment your interior scheme. If you’re in the middle of building your new home or are about to start the process, you can easily add any of our glass wall or door products to your build. If your interior colours scheme includes light, earthy tones, or natural cool colours,our clear glass doors will set off these elements within your home. If you have darker colours in mind, adding a cloudy finish to your glass doors will provide an additional layer of sophistication that won’t interfere with your overall colour scheme. If you want to brighten up a space, adding colour to your glass interior wall is also a great option. All of our door inserts can be coloured to any colour featured in the dulux range. Simply chat to one of our staff about your specific requirements. Are you ready to add some unique finishing touches to your home? Contact the team at CustomCote today to get a free quote and find out how we can help you get started. The entranceway into your home is one of the first impressions visitors to your home will get about what to expect inside. Depending on what you want to convey, installing a glass door with a minimalist look can provide a clean and modern look. But maybe you want to do something more, perhaps you want to add glass doors to other areas of your home. 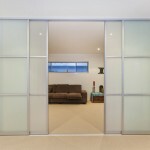 Below you will find more ideas about how you can incorporate glass doors into many different areas within your home. For first time visitors and family and friends, this is the first place they’ll greet you.If you want to make a good first impression, adding a seamless glass door is a great option. You can make it reflect your still by adding colour to it (anything from the dulux range) or by leaving it clear so that visitors get a glimpse into your life. The options are limitless, it’s up to you to decide on the first impression you’d like to make. If you’re looking to provide a seamless blend between your indoor and outdoor areas, adding a glass door to your back door area is a good option. While inside your home, you’ll have an uninterrupted view of your back yard and vice versa, providing a natural connection between both spaces, and allowing you to keep an eye on the kids in the backyard. If you have a two­storey house, adding a sliding glass door to your upstairs bedrooms is a great way to let in natural light and to get a view of the great outdoors. If you live in the city,adding colour and a cloudy finish will provide you with the privacy you need. If you’re looking for a way to update your existing bedroom, try adding glass sliding doors to your wardrobe. You can make these mirrors, so that you can have floor to ceiling views of your room reflected back at you. If you’d like to see your clothes without opening doors, simply add a see­through sliding door, allowing you to choose what you want to wear quickly. If you have a home office that is close to where all the action is happening, such as the kitchen or lounge, adding a glass door or divider to your home office will provide you with the separation that you need, while also allowing you to see what’s going on when needed.You’ll also be able to let in more natural light, adding to a more ergonomic environment from which to work from. If you’ve been looking to enhance different parts of your home or office, then considering installing glass doors is a great option that is also cost­effective.